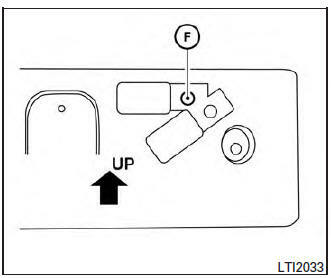 Park the vehicle on flat, level ground. Locate the center position A as illustrated. Line up the license plate bracket under the top of the front bumper B with the tabs C .
Hold the license plate bracket in place. Mark the center of the hole D with a felt-tip pen. Insert the grommets into the holes in the bumper fascia. Insert a small flat-bladed screwdriver into the grommet hole to turn the threaded part of the grommet 90° E .
Mark the center of the hole F on both sides with a felt-tip pen. Remove the bracket from the bumper, and then open 0.79 in (20 mm) diameter holes on the bumper using the marks F as a center. 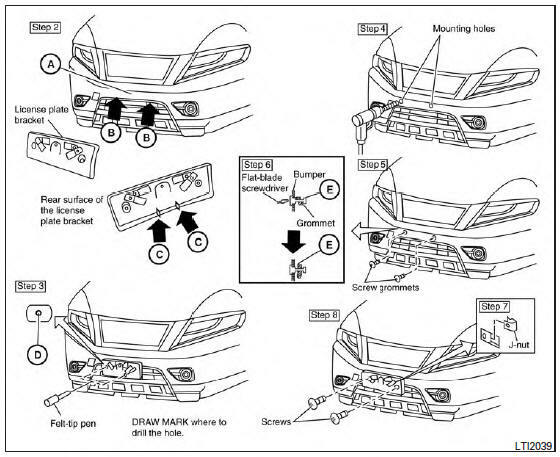 Insert a J-nut into the license plate bracket before placing the license plate bracket on the fascia. Install the license plate bracket with screws. Install the license plate with bolts that are no longer than 0.55 in (14 mm).